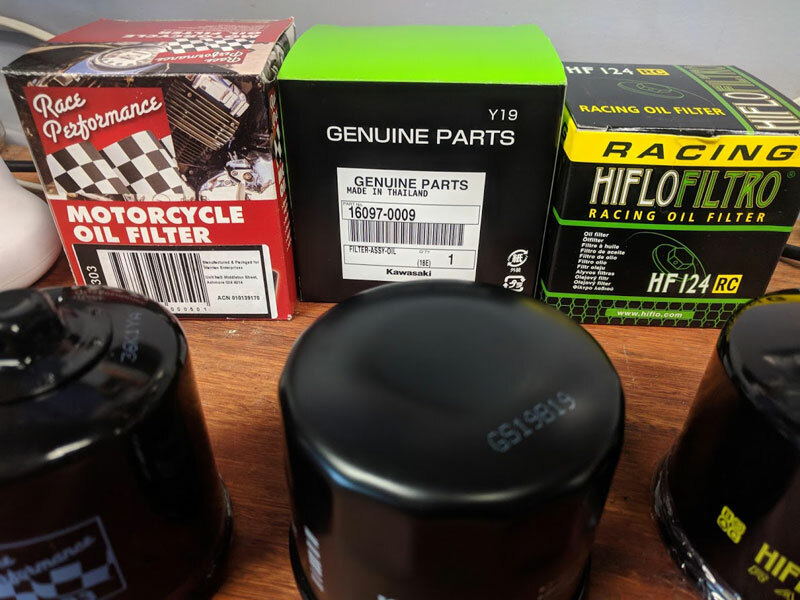 Kawasaki Ninja H2 Forum > Ninja H2 Tech Talk > Oil and Lube > Kawasaki Ninja H2/H2R Oil Filter. Kawasaki Ninja H2/H2R Oil Filter. Spent some time banging my head against the wall so thought I would post some info here to save someone else the headache. Thought I would see what else was available as I prefer to use an oil filter with a nut on top, easy to torque correctly, easy to remove, easy to race-wire it on the bike too. K&N have a lookup on their website, the 2015/2016 H2 is listed as a KN-303 and this is where the headache starts. 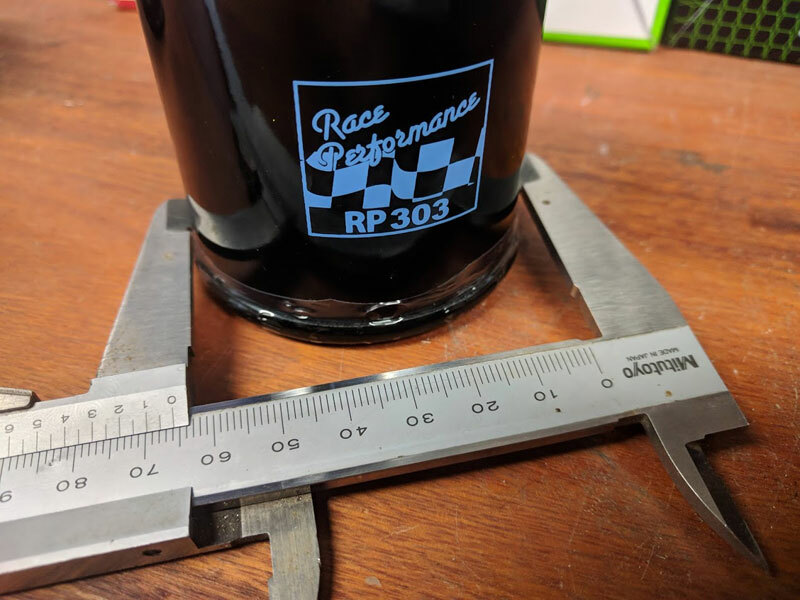 The 303 is the right filter for a Z900RS, Z1000 , ZX10R, ZX14, Ninja 400 and about a million other Kawasaki's including even Jetskis. The KN-303 filter is 65mm wide instead of 80mm wide and while it has the same thread and similar size o-ring (3mm difference in diameter) it's certainly not the same filter. Kawasaki could have easily used the 16097-0008 but instead developed a filter that is only used on the H2/H2R. 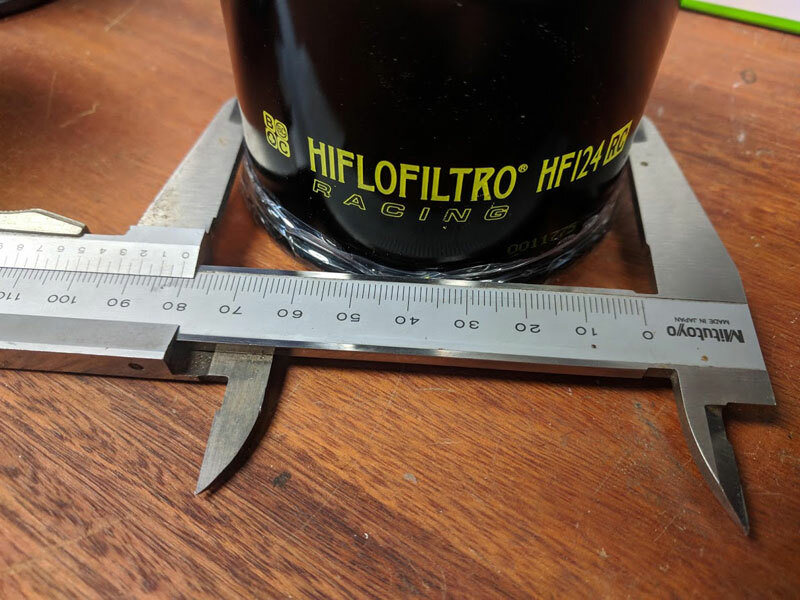 The 15mm canister size difference would equal a much bigger surface area of the internal filter and they obviously thought it necessary, unlike K&N who seem to think if it screws in it's okay. 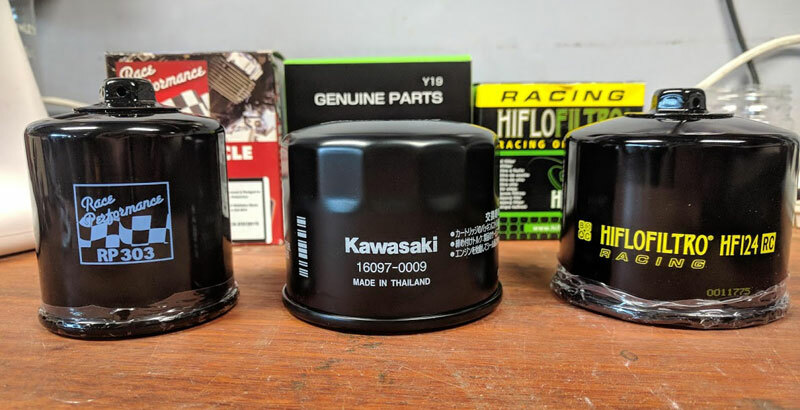 The KN-303 & KN-303C is the recommended oil filter for the 2015 Kawasaki ZX1000 Ninja H2R, the oil filter is designed to meet or exceed the OEM specifications. They weren't interested that the H2/H2R was a different part number and the filter was a different size. Race Performance (prob an Aussie brand) also make a RP-303 as a 16097-0008 replacement but don't list it for the H2/H2R. It's a good filter on my 900 and my sons 400 but I'm not about to put an undersized filter on the H2. HifloFiltro do make a specific Ninja H2 / Ninja H2R filter in their "racing" series with 17mm lock-wire drilled nut on top. What happened to K&N? They used to be a good company. [email protected] and [email protected] (both anonymous replies) were totally disinterested in the part number and size difference. The punchline is HIFLO who also make a 303 filter understand that the spec of the H2 filter might actually be important. Last edited by ayjayef; 10-24-2018 at 05:28 AM. When it comes to these H2 engines, Kawasaki has done thousands of hours of testing to ensure maximum engine performance, safety and reliability. I wouldn't recommend using anything but the recommended OEM oil & filter on these engines. TedG and enzo200500 like this. Completely & utterly agree, I would never consider anything other than the genuine OEM item. enzo200500 and H2Lou like this. The reason the H2 has a different, bigger filter is because it needs to flow more oil and still filter efficiently. The H2 sprays oil everywhere, the transmission has oil sprayers, even the supercharger gears have oil moving through them. A smaller filter will not flow enough oil to maintain the pressure needed to satisfy the all the sprayers. Also if you put a smaller filter that can't handle the flow requirements it may blow a hole in the filter, or worse insufficiently supply oil . The pressure isn't all that high, but the volume is tremendous. On top of that, many aftermarket filters are junk, and switch manufactures as often as Craftsman tools switch manufactures. You don't know what you are getting. Also Kawasaki has a warranty, so their filters are probably built and tested to make sure that meet the requirements. Rant over. pebble35, Lamf1969 and H2Lou like this. Yeah, I get that but K&N don't! so their filters are probably built and tested to make sure that meet the requirements. Yep, minimum requirements at a price that Kawasaki is willing to pay and truth be told, probably from the same Thailand factory as the aftermarket options. The OEM filter won't damage your bike (at least you would hope so) but it doesn't mean it's the best filter or any better than an aftermarket filter from a reputable company who could destroy their business if they produced filters that didn't work as well or better than OEM. Didn't you just change your air filter from an OEM paper filter to a better performing synthetic filter (with less surface area)? What changes did you have to make to your OEM fuel mapping when you did it? Each to their own. If you think that what Kawasaki produced can't be improved on then run factory tyres, air filter, oil filter, exhaust, ECU etc. I understand that stance but I also think that there are many companies who exist only because they can do better than OEM, not just cheaper. I wouldn't use anything but the Kawasaki item either. I can imagine the reply they'd give if a filter failed and ruined the engine - and it was an aftermarket part. It's probably safer to buy a filter wrench for the 13 ft/lb tightening torque rather than buying non-recommended filters because they have a nut on top. pebble35, Simon0721 and enzo200500 like this. OEM only for me too. No reason to take risks on a critical engine part. Oil filters are a different animal. Why? Because the lack of info. If they had a comparison of how much oil they flow at X viscosity and filtering ability compared to a OEM, then you can make a reasonable decision on if it will work. Air filters publish and have been tested to death in comparison to OEM air filters, so we have an good info. Not so with an oil filter, there are no comparisons to the OEM H2 filter to anything anywhere. So how can we say an aftermarket filter is going to work? So show me one test of the H2 filter and a test of the aftermarket filter that shows it is equal or superior and I will apologize and STFU. Lamf1969 and enzo200500 like this. Last edited by TedG; 10-25-2018 at 01:08 PM. I cut open a load of filters for the ZZR/ZX14r bikes for the UK forum last year. These included K&N, Hiflo filtro, Mann etc. Compared to the genuine Kawasaki 16097-004 made in Japan and the later 16097-0008 made in Thailand filters, they were all varying levels of cheap crap! The K&N even had the pressure relief spring out of alignment from new! Why try and save pennies, when the OEM ones do the exact job they were designed for? pretty much an Amazon infomercial, But interesting comments at the bottom about K&N , not something i have heard before anyone able to verify the comments ?